Last week turned out to be a celebration of “minis”. It did not start that way, but as I soon discovered in my adventures with my son, it was deemed to be a theme! Our Spring Break began by spending hours at our local Lego Store searching for all 16 individual Minifigures for Series 9. We then wandered through the California Automobile Museum whose current collection included PINT-SIZE: Microcars on the Road exhibit – love these minis, just like the ones in the Cars movies! We then ventured amongst the incredible flying machines at the Aerospace Museum of California and while there we boarded the mini simulator for an incredible flight around history. We also played 36 holes of mini golf at the Scandia Fun Center on a warm and beautiful day. And to top it off, we hopped onboard “Little James” the mini steam locomotive at the Folsom Valley Railway and road the rails again and again! It was a fabulous week spent with my fabulous kid! So, in celebration of our “mini” adventures, here is an amazing treat. These minis are the perfect combination of a donut taste in a mini muffin shape surrounded by sweet cinnamon-sugar. These warm and wonderful balls of heaven will not only melt in your mouth, you’ll wish you made a double batch! These are so good that I’m not sure if there is a “best” time to eat them as they’re perfect for a breakfast treat, an afternoon snack, or as a wonderfully warm dessert. Heat your oven to 350 degrees. Grease (using spray Pam) two miniature muffin pans (each with 12 cups) and set aside. In a large bowl, cream the butter and sugar until light and fluffy. Beat in the egg and then the milk. In a separate bowl, combine the flour, baking powder, salt and nutmeg; then add to the creamed mixture until moistened. Note the mixture will be thick. Spoon the mixture into the muffin cups, approximately two-thirds full, or until you have evenly distributed all mixture into the 24 cups. Bake for 15 minutes, or until a toothpick inserted near the center comes out clean. Cool for 5 minutes before removing from pans to wire racks. In two separate small bowls, melt the butter in one and in the other combine the sugar and cinnamon. Gently dip warm muffins into melted butter, then roll in cinnamon-sugar mixture. Place on waxed paper to cool. Serve warm. These morsels were so delicious that may son ate them even without the cinnamon-sugar topping. He also had a brilliant idea and ran to the fridge and squirted out some Hershey’s Chocolate Syrup to use as a dipping sauce! Here’s to the amazing minis, all of them! And to my son, thanks for a great week together! xxoo. I’m off now to get my son back to school and me back into the swing of things at the office! 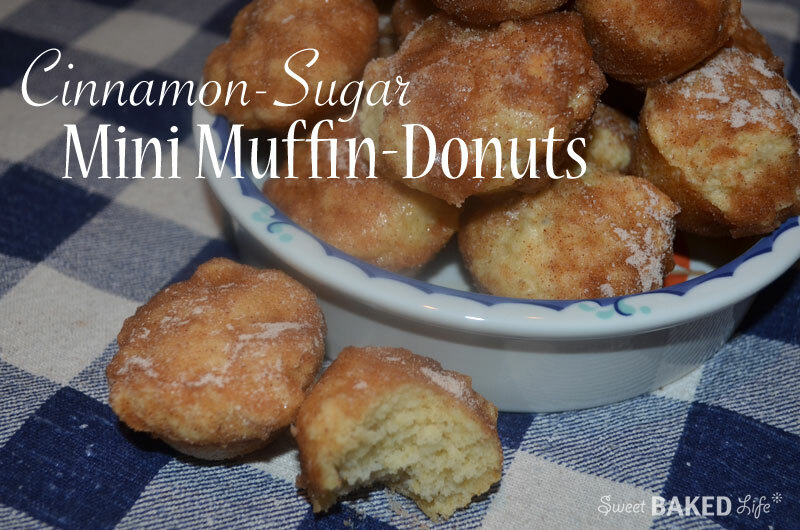 So have a great week and don’t forget to sweeten it with a batch of these fun and delicious Cinnamon-Sugar Mini Muffin Donuts! These look delicious! I will give your recipe a try!